AUTUMNAL LONGCHAMP has been the scene of many thrilling performances down the years and the Paris venue witnessed another on Sunday, September 12, when Midday enhanced her Cartier Racing Awards credentials with a dominant victory in the Group One Qatar Prix Vermeille. On a weekend of outstanding European racing at Doncaster, the Curragh and Longchamp, Midday’s fifth Group One triumph took her Cartier Awards points tally this year to 104, placing Cartier Older Horse category leaders Goldikova (112 points) and Starspangledbanner (112) firmly in her sights. The Cartier Racing Awards recognise excellence in horseracing and the awards are the sport’s equivalent of the Oscars. Split into eight categories for the year’s top horses, including the particularly coveted Cartier Horse Of The Year, the awards are determined by points earned in Pattern races combined, at the end of the season, with the opinions of a panel of racing journalists, as well as votes from readers of the Racing Post and The Daily Telegraph. European horseracing's most prestigious accolades will be presented for the 20th time on November 16, during a glittering ceremony before an invited audience in the ballroom of London’s Dorchester Hotel. 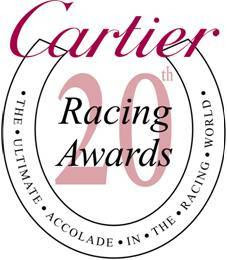 The Cartier Racing Awards were established in 1991 to recognise the achievements of racehorses in Europe. There is also the Cartier/Daily Telegraph Award Of Merit for the person or persons who, in the opinion of the special 18-strong Cartier Jury, has/have done most for European racing and/or breeding either over their lifetime or within the past 12 months. Trained by Henry Cecil for owner/breeder Khalid Abdulla, Midday saw off a classy pair of fillies, Group One Grand Prix de Saint Cloud winner Plumania and previously unbeaten Group One Prix de Diane heroine Sarafina (72), as she posted an excellent third Group One win from four starts this season. The four-year-old Oasis Dream filly’s next outing will see her attempt to clinch a second Grade One Emirates Airline Breeders’ Cup Filly & Mare Turf victory at Churchill Downs, USA, in early November. The juvenile divisions’ various form threads are beginning to interweave and Pathfork emerged as a strong candidate for Cartier 2-Y-O Colt Award recognition when defeating a top-class field to win the Group One boylesports.com Vincent O’Brien National Stakes at the Curragh on Saturday, September 11. Unbeaten now in three starts, Jessica Harrington’s charge saw out the seven-furlong trip well as he held Casamento by a head with the Aidan O’Brien-trained Group One Keeneland Phoenix Stakes winner Zoffany five lengths back in third. Two weeks earlier, on Sunday, August 29, the O’Brien-trained Misty For Me saw off the Harrington-trained Laughing Lashes (36) to take the Group One Moyglare Stud Stakes and leap to the top of the Cartier 2-Y-O Filly category with 40 points. Hooray (28) followed success in the Group Two Jaguar Cars Lowther Stakes at York in August with a Group Three win in the totepool Sirenia Stakes at Kempton on September 4, while Moyglare Stud Stakes flop Memory has 24 points, the same as Godolphin’s White Moonstone, who easily landed the Group Two Keepmoat May Hill Stakes at Doncaster on September 10. Cape Blanco received plenty of plaudits and rightly so after he pulverised a top-class field to win the Group One Tattersalls Millions Irish Champion Stakes at the Curragh on September 4. The Dubai Duty Free Irish Derby winner had finished 11 lengths second to Harbinger in the Group One King George VI & Queen Elizabeth Stakes at Ascot in July but relished the drop back to 10 furlongs as he made all for a resounding five and a half-length success over Group One Juddmonte International Stakes winner Rip Van Winkle, with the five-year-old Emirates Airline Champion Stakes and Coral-Eclipse Stakes hero Twice Over a short-head back in third (92). With 136 points, Cape Blanco now sits second to triple Group One-winning miler Canford Cliffs (140) in both the Cartier Horse Of The Year and Cartier Three-Year-Old Colt categories. O’Brien was on the mark the same card with Lillie Langtry who took her Cartier 3-Y-O Filly tally to 72 in the Group One Coolmore Fusaichi Pegasus Matron Stakes over a mile. Successful in the Group One Coronation Stakes at Royal Ascot, the Danehill Dancer filly held Spacious by a neck with Music Show (80), her conqueror in Newmarket’s Group One Etihad Airways Falmouth Stakes, back in third. Dual Oaks heroine Snow Fairy, a non-staying fourth to Arctic Cosmos in the final British Classic, the Group One Ladbrokes St Leger at Doncaster on September 11, tops the division with 118 points, 20 more than fellow dual Classic winner Special Duty. In the Group One Irish Field St Leger, also run on September 11, the Jeremy Noseda-trained Sans Frontieres saw off Profound Beauty to win his third race on the bounce and move second in the Cartier Stayer division with 32 points, 16 behind the Ascot Gold Cup winner Rite Of Passage. Markab’s excellent demonstration of speed clinched victory in the Group One Betfred Sprint Cup over six furlongs at Haydock on September 4 and put him in contention for Cartier Sprinter honours with 52 points. Henry Candy’s charge had Starspangledbanner, currently top of both the Cartier Sprinter and Cartier Older Horse divisions, back in fifth. Regal Parade, sixth at Haydock, has 40 points, while King’s Stand Stakes winner Equiano has 72 points. Harry Herbert, Cartier’s racing consultant, commented today: “This year’s Cartier Racing Awards are wide open, which makes the coming weeks particularly exciting. “Midday and Cape Blanco have leapt back to the fore in recent weeks to challenge the likes of Snow Fairy, Makfi, Canford Cliffs, Goldikova, Starspangledbanner and Harbinger in the Cartier Awards standings, and there are talented horses like Investec Derby winner Workforce and last year’s Cartier 2-Y-O Colt St Nicholas Abbey due to make comebacks.